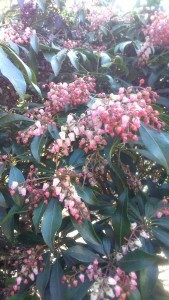 Pieris japonica ‘Dorothy Wyckoff’ a member of the Ericaceae family can be found in the Rock Garden. Other Pieris can be found around the Garden. This highly ornamental evergreen shrub, with foliage taking on a bronze hue in autumn, is covered in flower spikes (inflorescences) of a rich purple red during winter. The small urn-shaped flowers formed of the corolla (the conspicuous part of the flower – the petals), are pale pink in bud, opening white, contrast well with the deep red calyx (the outer part of the flower – the sepals). In fact the whole shrub appears to have a dark red hue. This plant was originally bred in the USA about 1900 and was awarded an AGM (award of garden merit) in 1984. Pieris require the same cultivation requirements as rhododendrons. Some of the early growth can be damaged by late frosts, so growing them beneath light shade can be beneficial.